Here we go again. I just posted version 1.4 of the Remember Mismatched Domains extension for Firefox, Thunderbird and Seamonkey. The big news for this release: it works in Linux! (Original Tux design by Larry Ewing, Simon Budig and Anja Gerwinski). RMD 1.4 doesn’t work in OSX. Update 2007-07-31: See this post for a Mac version of RMD. Now, don’t go getting all weepy just yet. I’m pretty sure all we need to do is get the XPCOM component compiled on a Mac. Unfortunately, I don’t have one. That’s where you come in… A MacBook Pro aughta do the trick – email me for a shipping address ;-) Alternatively, I’ve posted the component source here. If someone wants to take a crack at compiling a .dylib and send it to me I’ll tuck it into RMD. (Though, I’m not sure there’s an intel version of the Gecko SDK yet). The Remember Mismatched Domains extension for Firefox and Thunderbird adds a “Donâ€™t warn me again about this certificate for this domain” checkbox to the Domain Mismatch and Expired Certificate warning windows. When selected the domain name and security certificate domain pair (or certificate and expiration date pair) is stored in a Firefox / Thunderbird preference and the security error dialogue will be bypassed on subsequent visits. The comments section awaits your rants, bugs, problems, praise and more. Oh, and if you were using any RMD hacks, you can probably undo ‘em now. I posted recently that Thunderbird on Windows XP wasn’t remembering the mismatched domains. I updated to 1.4 and the problem is gone. Excellent. I appreciate the update Tony. Hopefully this latest incarnation of RMD will clear a number of issues. Here’s another happy report. Thanks for doing the work to get this bug squashed, and remove the nuisance of the blinking screen. 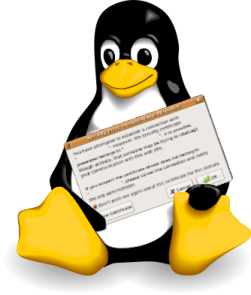 Is Linux support the only change in RMD 1.4? Previous versions work just fine in OS X and I’m unclear why support has been dropped. Yes, Linux support was the only real change in 1.4 (though it meant a significant change code wise). I’m guessing you were just fine with prior versions of RMD in older (1.5) versions of Thunderbird or Firefox? In which case I’d say you’re cool sticking with RMD 1.3.4. Just please be sure to uninstall RMD when you upgrade FF / TB. Thanks for following up. I was using RMD with Firefox 1.5 and Thunderbird 1.5 and it worked then as well as it does now (with the equivalent of Nighty Tester Tools in MR Tech Local Install). I’ll just disable the update check for my copy of 1.3.4. I’m glad I won’t be missing much in the 1.4 version. Thank you for this extension, and thanks again for clarifying the changes for me. ps. There’s an unofficial Gecko SDK for Intel Macs at http://www.oxymoronical.com/view/1114 . I’d do this for you but I don’t have time right now to install it (and Xcode). I just wanted to thank you for the plugin and the update to get it working on Linux, it’s much appreciated! I use RMD a lot as I need it to update my blogs. I use OS/2-eComStation versions of firefox and the new version it’s not installed on it. Perhaps there isa mismatch in the installer taht checks for OSX? What version of Firefox? What is the platform string FF references when it fails to install RMD 1.4.x? Error message calls the architecture SunOS_sparc-sunc. What version of Firefox or Thunderbird? Just to add more fuel, RMD 1.3.4 doesn’t play nice with OSX-TBird 2.0.0.4. 95% of the time TB throws an error about not being able to connect to the SMTP server. Disabling clears it up. The other 5% is immediately after re-enabling it, when it presents the checkbox. Great Thunderbird Add-on! I just found it and find it very useful. Really useful add-on. Hopefully it will be added to the core dialog in future! Probably a section to maintain the list in the options/security-dialog would be the completition of this feature. RMD would certainly make my life easier, so I’m willing to put in a little time to help. “Remember Mismatched Domains” could not be installed because it is not compatible with your Thunderbird build type (Linux_x86_64-gcc3). Please contact the author of this item about the problem. So hereby I have contacted you. If you need me to compile something on this platform for you, can you e-mail me some detailed instructions. I am not a newbie, but not a C-programmer either. Note however that the latest version of Thunderbird (2.0.0.6) seems to have broken RMD. I ‘upgraded’ my SeaMonkey to the latest 1.04 security upate and now RMD 1.4 doesn’t work. Have I installed RMD or SeaMonkey incorretly, or have those nice people at Mozilla ‘fixed a weakness’ which allowed RMD to work? Which operating system are you seeing this with? Thanks for getting back (I should have said SeaMonkey 1.1.4). Anyway, I’m on Win XP Tablet edition – latest updates, etc. Also I installed RMD 1.4.1 on my wife’s Win 98SE with Seamonkey 1.1.4 — that too doesn’t ‘remember’ mismatched names. In both cases, when clicking on TOOLS, REMEMBER… we get a list of the same domain names repeated over and over. So each time we ask it to remember, it is stored in a database but not referred too after that, it seems. Works great, thanks. One question, does this add-on pair a specific certificate from the mismatched domain to the second domain? If the mail server (I’m using it with Thunderbird) renews or changes its certificate, will the add-on notice this? Does it examine the certificate itself, the MD5 hash or the expiration date to compare it with the one saved? > Does RMD 1.3.4 work on your platform? Yes, I use it regularly on every build of firefox that has been compiled since the update. There is no need for the update, but it’s annoying to mark out the update feature. And now I need on thundebird. It’s 1.34 available now? lol, there must be a five month delay on the line. I was dumb to ask if 1.34 is there to download. Yes it is!, and I ask to you to get it alive as I will announce in a blog entry that it’s available to all OS/2 and eCS customers. In http://www.warpkstop.eu last week I noticed the need to publicize it as many people dosesn’t knew his use. @Dave Driver. Crap. That’s the “Linux problem” we’d talked about. 1.4.x was released to work around the Mozilla bug that was causing it. The challenge is it needs to built on the architecture it’ll be running on… The basic steps mentioned in this post about building RMD for the Mac should apply for Solaris.